Birqash Camel Market is Egypt's largest camel market, 35km northwest of Cairo, on the edge of the Western Desert, makes for a wild contrast to Cairo city life. It is considered the biggest of its kind in Egypt, and people from every social standard and also traders went there to get a relatively cheap and guaranteed health meat especially after the spread of diseases like bird flu, etc, also foreign tourists from all over the world come to this famous market, because they are keen on watching the Pharaonic monuments to see the largest gathering of camels (the ship of the desert). At dawn on a Friday morning, Cairo's camel market, Souq al-Gamaal, held hundreds of camels that had been driven across the shifting sands from Libya, Sudan, Somalia and Aswan only for them to end up hauling tourists at the pyramids or swinging by the hooves in a slaughterhouse. 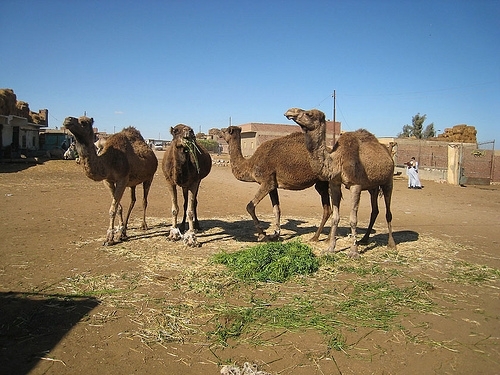 The camels reach the market in herds which begin its journey from (Omdurman) in Sudan, as Egypt imports about 90% of camels from Sudan, and the rest 10 % from Somalia. 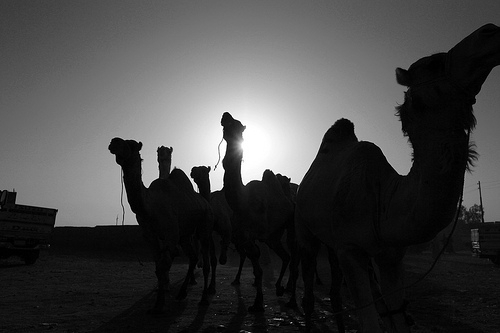 The convoy of camels comes to market usually, includes one hundred expert group led by pastors, and begin the journey from northern Sudan to cut about 1600 km in the desert between Egypt and Sudan, lasting 30 days and take the same route that was used by convoys across hundreds of years. As they said that they were guided by the stars at night and the oases and trees during the day. The camel trade is very profitable, because it had a very reasonable price compared with the high prices of other meat, like cows, buffaloes and sheep. The Camel meat is healthy, secure and free from any diseases or epidemics like the other kinds of meat. There are many types of camels but the most famous one called (Al-beshary)but there are other types like :Al zemkly ,Al el3nafy, etc. The price ranges from Jamal 2000-5000 three thousand pounds have sometimes up to four thousand according to supply and demand. Camels were used in several places in the world including the United States, as President Jefferson had an idea in 1855 when the army was in need of means of transport between the military centres in Texas and the Pacific Coast, after President Jefferson studied the similarities between South America and the West, able to obtain the adoption of Congress and imported about 300 Camel from Egypt that implemented its mission on the best way, until the American Civil War ended and was replaced camels Railway Lines. Finally, are you know how much is a Camel Worth in Egypt?! a single Camel can be bought from 200 to 400 US$ at Birqash market but in the pyramids of Giza is an easy 30 minute ride and shouldn’t cost you more than 6 US at least in theory.